Of all possible acts of political protest, my favorite is going to Mexico. Marching through downtown is important, so is writing columns, letters and tweets. And voting, please God, lots and lots of voting. But a few days in Mexico City combine two of my favorite things: resistance to an intolerant and race-baiting administration, and food. Amazing food. Most people I know haven’t been to Mexico City. They’ve been to Rome, London, Tel Aviv, Berlin, Prague. If they’ve been to Mexico, it’s Cabo, Cancun, maybe Tulum. 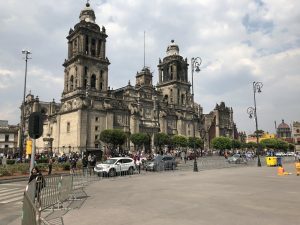 But Mexico City is just over a three-hour direct flight from Los Angeles, and it is every bit as much of a world-class city as the longer-haul European capitals. It’s like flying to Utah and landing in Paris. Except with better food, and cheaper. I first visited three years ago to cover a conference on Latin American Jewry. Most of that trip was spent in banquet rooms. This time Naomi and I went for our wedding anniversary. So it was rebellion and romance. Trump’s constant Tweet-bashing of Mexico and Mexicans precedes his election. In fact, it helps explain his election. “When will the U.S. stop sending $’s to our enemies, i.e. Mexico and others” he Tweeted in June 2014. He picked a bogeyman south of the border and used it to instill a sense of fear in voters. At least three post-elections studies have found that racism, rather than economic insecurity, drove white millennials to vote for Trump. “Economic anxiety isn’t driving racial resentment; rather, racial resentment is driving economic anxiety,” Vox reported. Post-election the anti-Mexican, the anti-immigrant drumbeat has only grown louder, with real policy implications, including crackdowns and deportations on non-violent immigrants and the threat of deportation for DACA recipients. These policies damage relations with Mexico and Latin America and, most stupidly, hurt America itself. Our economy depends on waves of ambitious and inspired immigrants. If you don’t believe this, just check your family tree. But as long as Mexico and Mexicans remain little more than stereotypes among the voting public, Trump can get away with it. He gets away with it in part because he feeds in to negative images of Mexico, Mexicans and Latinos promulgated by film and television and reinforced by news coverage that focuses mainly on south-of-the-border violence. The 2014 “Latino Media Gap” study found that only 1 percent of television news stories focused on Latinos, and of those 66 percent involved crime or illegal immigration. Trump is blowing on a hot fire. Fear perpetuates ignorance that feeds bad policy. Hollywood studios and newsrooms can make choices to help break the cycle, but so can each of us, by putting ourselves on a plane and seeing Mexico and meeting Mexicans for ourselves. Granted not everyone can, but more Americans should. And I would start with Mexico City. It’s close, inexpensive and –I say this with zero hyperbole – mind-blowing. Is it safe? Just be careful, not cowardly. In 2017 some neighborhoods experienced a spike in drug-related crime. Even so, Chicago, Miami and Philadelphia all had more than double the murder rate of Mexico City in 2017. We walked the streets until late every night, along with crowds of people. At midnight we walked six blocks to El Moro, a cavernous 1930’s churreria packed with couples, families and post-concert partiers dipping churros the size of lariats into mugs of hot chocolate. The point isn’t that it’s Disneyland. There were areas we were told to stay away from, as there are in Los Angeles, and we did. It’s a complex city of 25 million people – about the population of Australia — sitting on active earthquake faults, with too many cars and too much smog (though that’s better than it was as well) and its share of poverty and crime. But all the reasons tourists descend upon great cities — art, architecture, history, food, shopping, fashion, and nightlife — flourish in Mexico City. And add to all these reasons this one: at a time when too many Americans are eager to put up walls, 36 hours in Mexico City tears them down. Gran Hotel Ciudad. 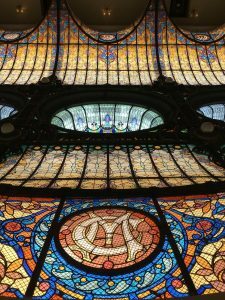 It’s an Art Nouveau masterpiece with an atrium-like lobby surrounded by lacy wrought iron banisters, antique exterior elevators and Tiffany stained glass ceilings. The last James Bond movie, Spectre, began with Daniel Craig leading a beautiful woman through the lobby and into his room at the Gran Hotel. And just because Mexico is full of surprises, it’s worth mentioning that if you look to the right as you pass through the entrance, you’ll see a large mezuzah embedded in the door frame. Our room looked out onto the National Palace, the Municipal Cathedral, and the Zocalo, second only in size to Red Square. Tourists, shoppers, and workers filled the square and streets below from morning until after midnight. The sounds of street musicians – violin, accordions, calliope—mingled with Mexican ballads coming from cafes and club music and car horns and street hawkers. Have a drink on the rooftop restaurant and watch the life of the city ebb and flow. Templo Mayor. The ruins of the original grand Aztec city have been turned into a walkable site that reveals something of the pre-Cortez city. Municipal Cathedral. Massive, ornate and still very much a part of the life of the city. Frieda Kahlo Museum. Buy tickets far ahead of time online. Even with the constant crowds, the museum provides an intimate look at the life and inspiration of the world’s most famous female artist. 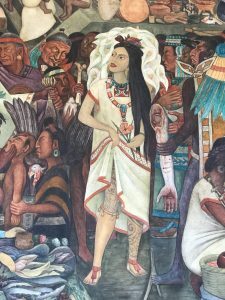 The Diego Rivera murals at the National Palace. Free. Awe-inspiring. Wandering the streets of the historic core as well as the Roma Norte, Polanco and Coyoacan neighborhoods. The core has grand architecture dating back to the 17th century. Roma Norte and Condesa are hipper and up-and-coming. Polanco is upscale, Rodeo Drive-esque (though with better museums) and Coyoacan, where the Frieda Kahlo House is located, is leafy and village-like. 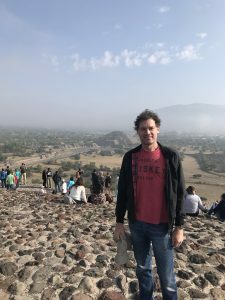 The pyramids and ruins of Teotihuacan. About an hour by car from the city, the site of a city that once held upwards of 250,000 people. We used a guide and arrived early to avoid the inevitable huge crowds. Museum of Anthropology. One of the world’s great collections, if a bit overwhelming. 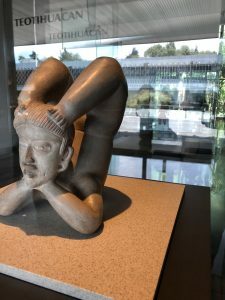 It features exhibits on the country’s indigenous groups as well as its pre-Hispanic civilizations. 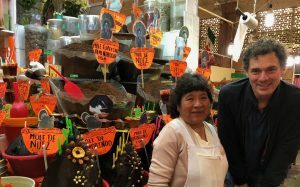 An EatMexico Food Tour. We took the company’s tour of Merced Market. I’ll write about this in a separate post, but four hours in the world’s second largest food market was a trip highlight. Justo Sierra Synagogue: This 70 year-old synagogue in the historic core is still in use, and provides a window into Mexico’s fascinating Jewish history. Pehua. 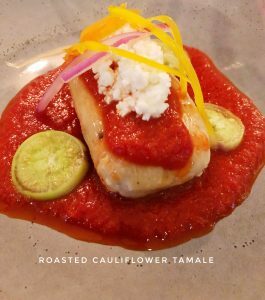 Chef Raul Valencia transmits his love of native ingredients and cooking techniques from throughout Mexico to the plate. We were not able to swing reservations at the more famous Pujol and Quintonil, and I can’t say I’m sorry. This was an unforgettable meal. Dulce Patria: Fancy and innovative in a beautiful setting. Sanborns: The original location of what is now a chain restaurant is in a stunning 18th century building clad in handmade tiles. On the inside stairwell you’ll find a moving mural by Jose Orozco. The food is inexpensive and unadorned. Roldan 37: A converted chile warehouse is now a lunch-only temple to chile-intensive cooking. Merced Market: More on this later. We went with a chef/guide, who cautioned us against tackling the world’s second largest food market on our own. Eight buildings, each the size of four football fields, surrounded by blocks of outdoor streets. Superb food stalls, a world of meats and produce—and no more than a handful of tourists. Café Avelleno: In Coyoacan, maybe the world’s finest cortado. Quentin Café: The Roma Norte’s most famous coffee bar. Delicious and friendly. Café Equis: The San’Eustachio of Mexico City, a venerable, busy temple of coffee near Merced Market. Order and pay for your drink, show the receipt to the barista. Just like Sant’Eustachio. Churreria El Moro: It never closes, and the lines never stop forming. At the front cooks fry ropes of crisp, sugary churros. Waitresses in blue and white uniforms rush them to your table with steaming cups of hot chocolate. Take out, too. I want nothing to do with Mexico other than to build an impenetrable WALL and stop them from ripping off U.S.